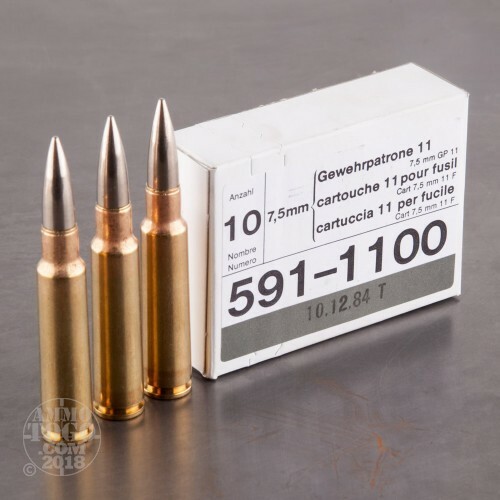 Are you looking for some high quality 7.5x55 Swiss ammunition. These Swiss Surplus rounds from RUAG are some of the highest quality, mass produced rounds available on the market today. Loaded into berdan primed brass cases, this ammo is non-corrosive and not re-loadable. Each projectile in this case of 480 is a 174 grain full metal jacket boat tail that has an average muzzle velocity of 2,560 feet per second. 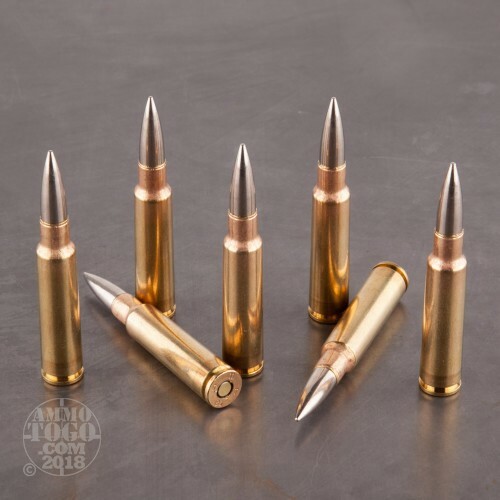 These hig quality rounds are loaded to the GP11 standard and offer excellent accuracy and reliability for your 7.5x55 rifle. RUAG loads these new production rounds to very tight tolerances making this surplus ammo very consistent and reliable. Pick up this 480 round case of surplus 7.5x55 Swiss ammunition while it lasts! 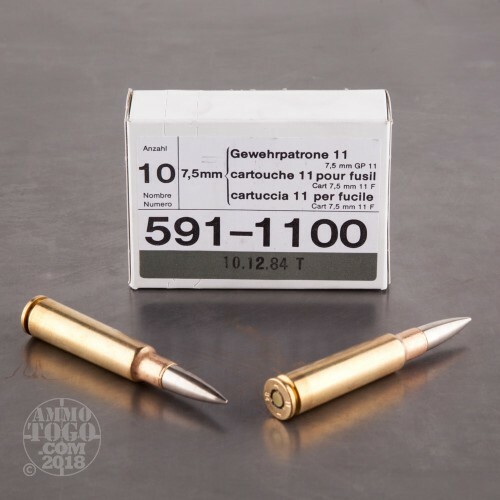 Great ammo for an even greater rifle! Awesome prices too! Unexpected speedy shipping. Ordered on Sunday and the GP11 arrived the next day, Monday! 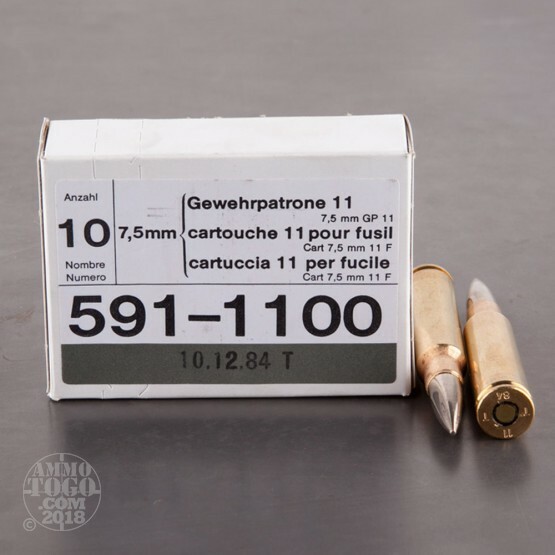 As others have commented, GP11 is great ammo and this was a great price! As others have noted this stuff is accurate and beautiful. The silver colored bullets seem to be just the thing for Vampire hunting!Appropriate for this time of year,Happy Halloween. posted on 9/18/16 by Joe I.
I shoot my K-31 using iron sights only. I paint a 4 inch bullseye on a steel silhouette at 300 yds and nail the it 4 out of 7 shots all day long. The surplus GP-11 is the best ammo you can buy and at a fraction of the cost. I wish Ruger would make the Precision Rifle in this caliber. As the first reviewer commented, the quality of the bulk box was pretty amazing. I had no expectation it would come in a black sealed box with a wax seal showing the date of packaging (1983 in my case). The box has solid fabric carrying straps that run from side to side, insuring they will hold things together under the most demanding circumstances. It was almost a crime to cut the seal to open the box. Inside, still wrapped in their original paper packaging, were 10 count boxes of ammo. Very sweet indeed! comes packed in the original bulk box, with a custody seal intact! You can't put better ammo through your K-31 or other Swiss gun. The K-31 and GP-11 combination wins more vintage bolt rifle CMP matches than all the others combined probably.